HCM City (VNA) – Despite rosy seafood export growth in the first seven months, Vietnamese enterprises still face a line-up of hurdles in the remaining months of the year, including input material quantity and quality and barriers from import markets, heard a conference in Ho Chi Minh City on August 28. According to General Secretary of the Vietnam Association of Seafood Exporters and Processors (VASEP) Truong Dinh Hoe, after a slight expansion of 5 percent in the first quarter of the year, mostly spurred by tuna, cuttlefish, octopus, Vietnamese shipments continued to soar over 10 percent in during April-June and 30 percent in July. Total Vietnamese seafood export in the seven-month period ending in July mounted to 4.4 billion USD, a year-on-year surge of 17.3 percent, Hoe stressed. With such gain, VASEP forecasts that total seafood shipments will reach 8 billion USD for the whole year, up 14 percent from last year’s figure, thanks to key exports like shrimp, tra fish, tuna, cuttlefish and octopus. However, experts said that major challenges, such as high anti-dumping duties and the US inspection programme, require domestic exporters to get constant updates to have appropriate export plans, especially the adaptation to the market fluctuations. At the conference, VASEP put forth activities to overcome trade barriers and build trade mark for Vietnamese tra fish, promote international cooperation and the domestic sale channel as well as develop added value goods. 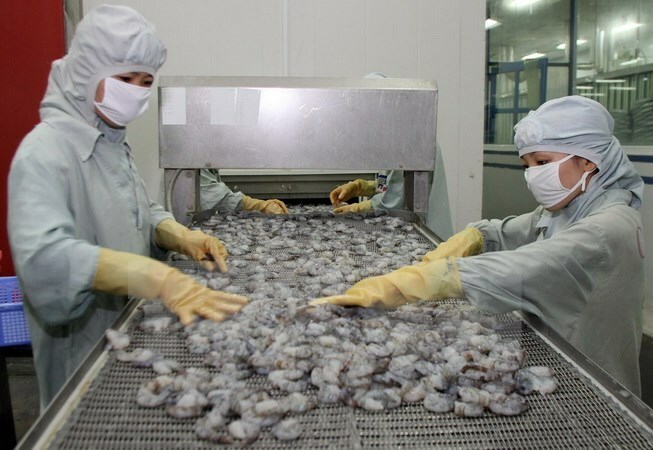 Meanwhile, Deputy Minister of Agriculture and Rural Development Vu Van Tam said that the ministry is making a beeline to realise the Government’s programme to build national trade mark for shrimp and tra fish.